* docomo sky is a trademark of NTT DOCOMO, INC.
NTT DOCOMO, INC and PT Solusi Tunas Pratama Tbk. (STP), a company that leases out telecommunication towers in Indonesia, announced that they have agreed to test a service, named docomo skyTM for Tower Inspection, that uses drones to photograph base stations and telecom towers and transmit the information to a command center in real time. The partners hope to expand the scope of the test to include other locations and facilities prior to launching a full-scale commercial service in the first half of this year. 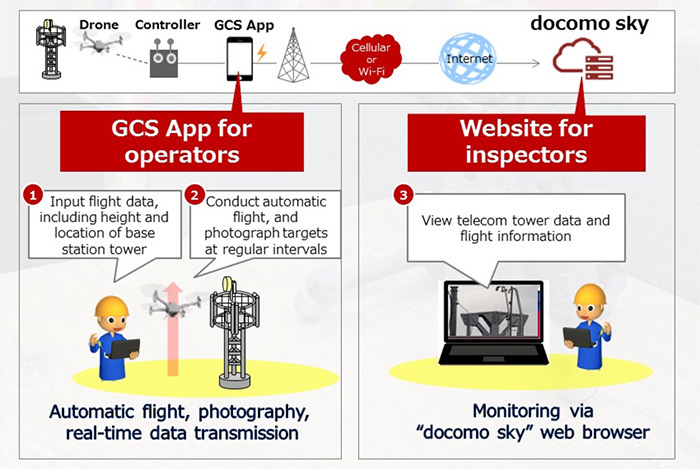 The system being tested is based on an operational drone-based tower inspection system developed by DOCOMO for its commercial network throughout Japan, and supports the “docomo sky” ground control station (GCS) app for assistance in inspection tasks, enabling drone operators to input flight data with ease. For the test, DOCOMO will provide its cloud-based platform for operational support and data analysis. The drones fly automatically, take photos and transmit the images via the platform in real time, enabling technicians to inspect the towers via the docomo sky web browser immediately. Indonesia is undergoing rapid urban development, including the construction of tall buildings and transportation infrastructure, which has resulted in large structures occasionally interfering with radio propagation from telecom towers. STP, which manages such facilities, must dispatch technicians to visually check conditions by climbing the towers. The new service will enable remote inspections to be conducted much more quickly and safely than at present, thereby allowing STP to achieve greater customer satisfaction with its service to mobile network operators. In addition, the service is expected to support efforts to speed up procedures for inspecting and restoring telecom facilities in Indonesia whenever a natural disaster occurs. Going forward, DOCOMO will continue to develop and upgrade its advanced drone services, one of the many ways the company is serving society by leveraging its diverse technical assets and know-how, including mobile network technology and platform businesses. NTT DOCOMO, Japan’s leading mobile operator with over 77 million subscriptions, is one of the world’s foremost contributors to 3G, 4G and 5G mobile network technologies. Beyond core communications services, DOCOMO is challenging new frontiers in collaboration with a growing number of entities (“+d” partners), creating exciting and convenient value-added services that change the way people live and work. Under a medium-term plan toward 2020 and beyond, DOCOMO is pioneering a leading-edge 5G network to facilitate innovative services that will amaze and inspire customers beyond their expectations. DOCOMO is listed on the Tokyo Stock Exchange (9437). https://www.nttdocomo.co.jp/english/.